LOS ANGELES — What began as a small brush fire along a freeway in drought-stricken Southern California morphed into a massive blaze fueled by gusty winds and dry vegetation. 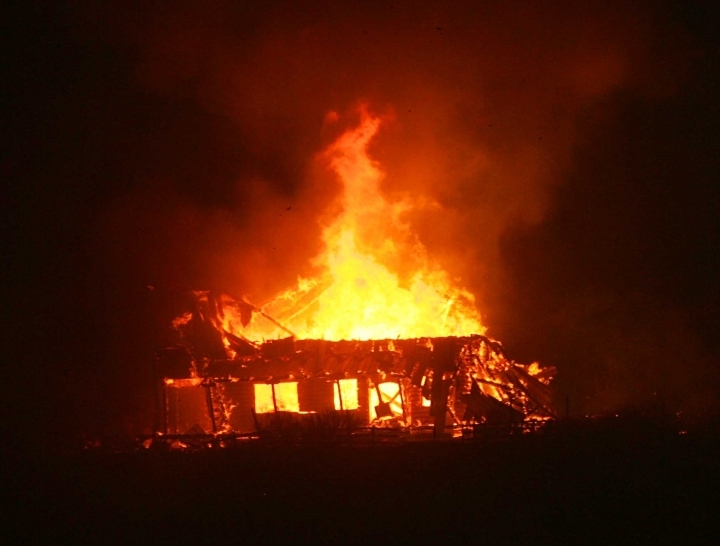 Swift-moving flames gutted a historic Route 66 diner, burned homes to their foundations and forced tens of thousands of people to flee the Cajon Pass, a mountain pass between the San Bernardino Mountains and the San Gabriel Mountains. Wildfires have ripped through California in the past, but recent fires have grown stronger and hotter. A persistent statewide drought has killed scores of trees and dried out swaths of land, creating incendiary conditions. The blaze that erupted Tuesday in a mountainous region about 60 miles east of Los Angeles quickly burned out of control in less than 24 hours, surprising even the most experienced firefighters. "In my 40 years of fighting fire, I've never seen fire behavior so extreme," said Incident Commander Mike Wakoski. After a destructive fire season last year, 2016 is shaping up to be equally bad. "It's to the point where explosive fire growth is the new normal this year," said Glenn Barley of the California Department of Forestry and Fire Protection. Jennifer Martinez was at work Tuesday when she got a phone call from her kids' daycare center urging her to pick them up. Just hours before they had also been evacuated from their elementary school. When they reached their home in Phelan, the 28-year-old Martinez said a dark, thick cloud of smoke hung above them. She spent 20 minutes in the house, grabbing their dog, tortoise, asthma machine and basic belongings. "I basically just grabbed bags and emptied out two drawers of clothing for each child," Martinez said of her five kids, as young as 5 and 3 years old. "I also took one toy for each of them so that if we did lose our home they'd have something to hold onto." "They were very afraid, they didn't know what was going on" she said. Just as she was heading out, Martinez heard a loud metal noise outside. A vehicle had hit a sign, which it was dragging down the road, sparking flames. "Maybe he lost his house, or he was going through his own anxiety," she said about the driver. "I was so nervous. I just left as soon as I saw the car." Leo Hordyk, owner of the Grizzly Cafe in Wrightwood, is staying put for now and keeping his cafe running despite the order to evacuate. "I feel like I need to be here to serve our community," the 54-year-old said. With the help of his chef and a small staff, the cafe served breakfast and lunch to first responders. It was the third time Hordyk kept his cafe open during a wildfire. He also worked during fires in 2009 and 2010. The fire is burning through a mountain pass rich in the history of the American West. The Cajon Pass, which divides the San Bernardino and San Gabriel mountains, was created by the movement of the San Andreas fault and erosion and has long been a significant natural pathway through Southern California. Long before the I-15 freeway ran up its rugged slopes toward Las Vegas, Native Americans, and mining settlements once dotted the landscape. In the 1840s, the pass was the scene of huge horse-stealing raids staged by outlaws, and the Mormon pioneers who founded San Bernardino in 1851 traveled the passage in covered wagons. There is a scenic spot in the pass known as Mormon Rocks. The railroad came in the 1880s. The blaze, dubbed the Blue Cut Fire, is named for a narrow gorge carved by the Cajon Creek, known as the Blue Cut. 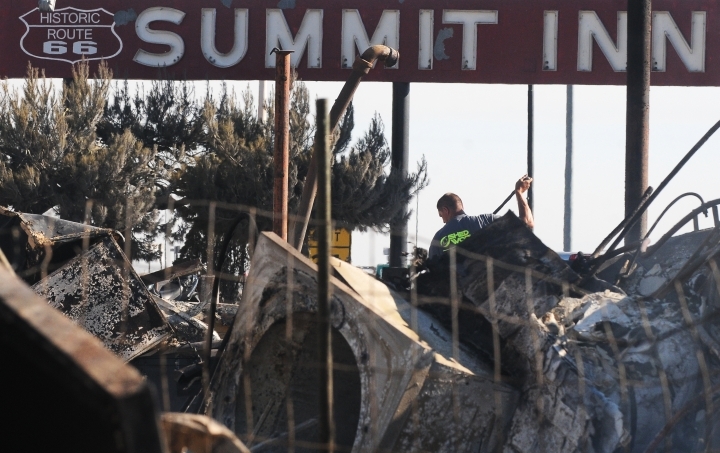 The Summit Inn, a popular pit stop between Los Angeles to Las Vegas, was destroyed in the fire. The diner opened in 1952 and boasted celebrity guests such as Elvis Presley, Clint Eastwood and Pierce Brosnan. Several staff members returned to the restaurant Wednesday to sort through charred valuables from a safe. A post from the Summit Inn's Facebook page read: "It is beyond comprehension how this could possibly happen!" AP writers Delara Shakib and Christine Armario contributed to this report.